Hollybeary Creations : NND reveal Day 3!! Happy Wednesday!!! 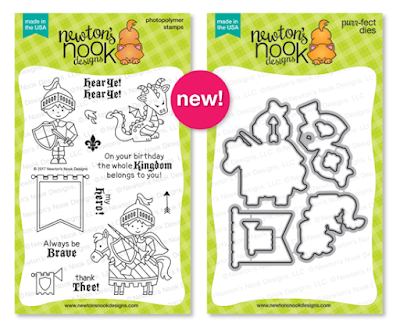 Its' day three of the Newton's Nook August Reveal and today we are introducing Knight's Quest and its coordinating dies. This is another magical set in this release complete with a Dragon. I created a project using just the banner in the set and the Fun Hear Ye! Hear Ye! sentiment. I created a Sand colored card base and then I added a piece of pattern paper from Echo Park that I die cut with a stitched rectangle die. Then I die cut another piece of that sand colored card stock and stamped the fleur de lis randomly with some VersaMark ink. Then I stamped the sentiment along the bottom. I stamped the banner image and sentiment onto some Bristol card stock and colored it in with Zig Clean Color Real Brush markers and a water brush. Then I used the coordinating dies to cut it out. I adhered it above the sentiment with some foam tape. This is a really fun set to pair with the Once Upon a Princess set as well. Would you like to win the “Believe in Unicorns” Stamp Set? Your background papers tie in so well!! Really cool card. Awesome card! 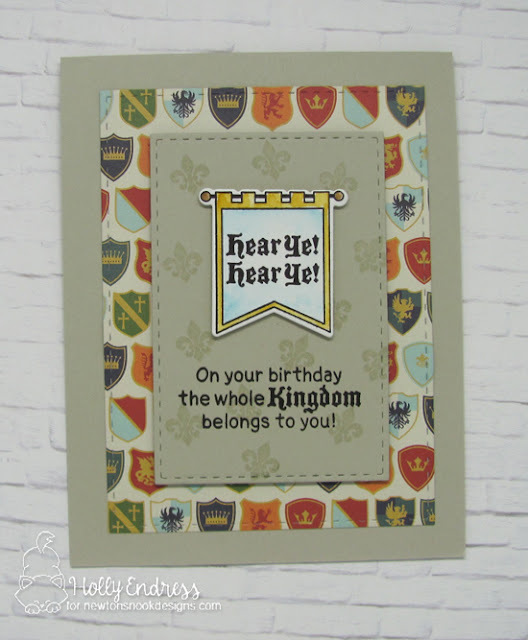 Love the banner and sentiments, and that patterned paper is perfect! Pretty card...I like how you used the sentiments from this set on your card. Too bad the patterned paper was not PERFECT for it...wink, wink. GOOD job! I love the use of the banner by it's self, this turns a rather "cute" stamp set into a masculine card for any age! Great background paper! This is a great idea! It's such a fun card--my hubbie would love this one! I like the use of the smaller images in this set...fun masculine card. Great card!! 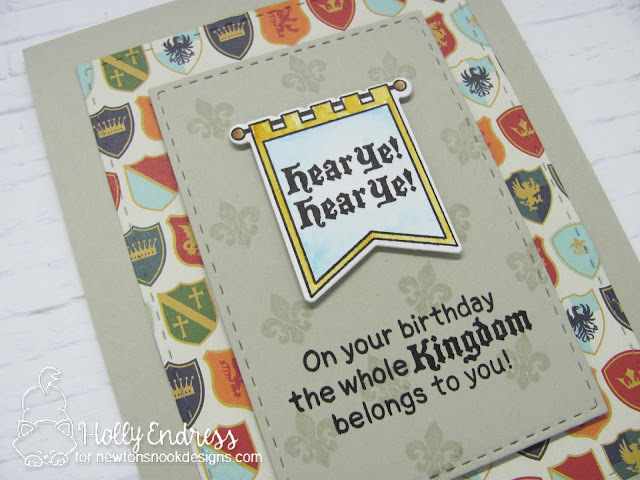 I love how you stamped on kraft and made the focal point on the banner. Great card and the patterned paper is perfect. Cute card! The theme is perfectly knightly! LOVE everything about this card! How fun!